No walk today. 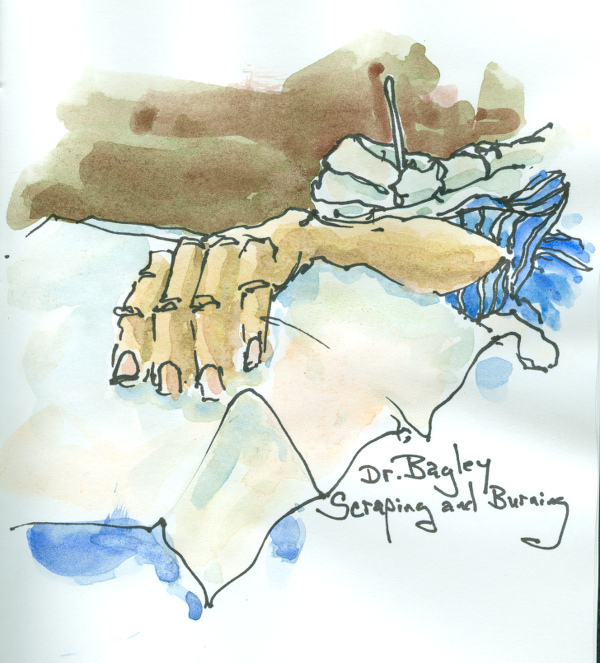 Dad had an appointment with Dr. Bagley to have the Squamous Cell Carcinoma in Situ scraped and burned from his arm. As might be expected when time for a shower is limited, Dad took an extra half hour in the bathroom. We made it to the doctor’s with four minutes to spare. We waited another ten before we were called to follow the nurse down the hallway. 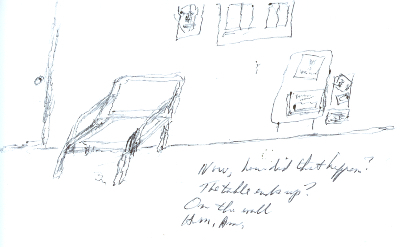 While waiting, Dad reluctantly agreed to draw and write. 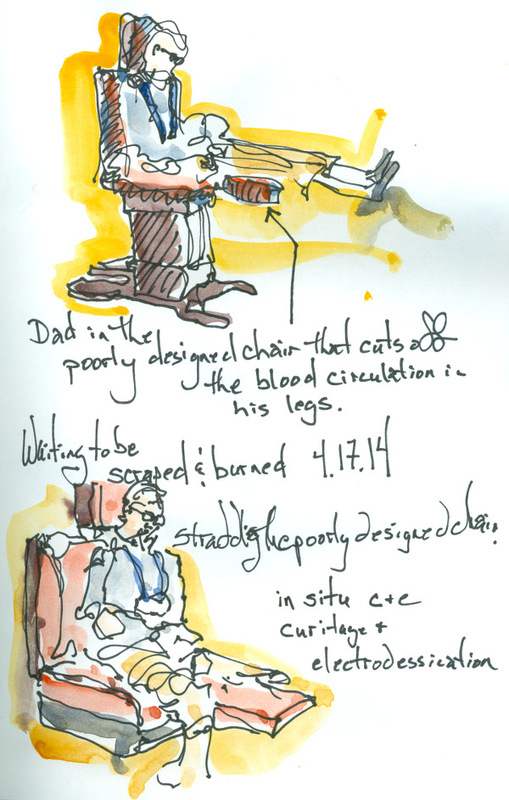 Though unable to comprehend the need for another visit to a doctor, Dad followed directions and climbed into the “procedure” chair. The lovely nurse lifted the leg rest, bid him “Make yourself comfortable” and left the room. Dad scowled and called out to her. He lasted all of two minutes before flopping his legs off each side of the leg rest. Dr. Bagley arrived and the four of us enjoyed a short conversation regarding the chair. the procedure took less than ten minutes. As the wound on Dad’s arm was being scraped and burned, the nurse shared her story of disappointing her engineer father by not being able to draw in perspective when taking classes toward an engineering degree (that she didn’t want to pursue anyway. Her father had designed the GM facility in Linden, NJ. During the design stage, a scaled model of the building lived on her dining room table forcing the family to eat in the kitchen for several months. One evening her father was perplexed and asked what had happened to all of the bathrooms. All fifty of them had been moved away from the elevator shaft area. Her brother explained that her really didn’t like the way the bathrooms looked located next to the shaft and had taken it upon himself to make the layout a bit more visually pleasing. Her father explained the reason for locating the bathrooms next to the shaft was that all the plumbing could be run through the shaft, saving a great deal of expense. The brother acknowledged that the reasoning was okay and took it upon himself to return all fifty bathrooms to the location in his father’s original design. Priceless story, Priceless glimpse into the lives of others, the lives of children who grow up in families with inventive parents who include their children in the thought process from planning through to execution. The nurse’s brother has followed in his father’s footsteps, designing the plumbing and ventilation systems in corporate buildings. Just as her story ended, the procedure was completed and we headed out into the beautiful, sunny but chilly afternoon. The smell of fresh cut grass, the first of the season, filled our nostrils and brought smiles to our faces. Another good day with Dad.